There are several credit cards that are now offering free credit SCORES when you have an account with them. This is NOT a credit report, rather a score. Here are the 3 companies currently offering the free score. Discover is one of my favorites as it has no annual fees and many other great benefits. It's a number ranging from 300-850. This POST explains it all. A report shows all of your open and closed accounts in the past 7 years. It shows what accounts are in good standing, delinquent, contact information, etc. It does NOT give you credit SCORE. If you want a free credit REPORT you can get one from annualcreditreport.com. You can get a free report from all 3 credit bureaus (Transunion, Equifax, and Experian). You can get this report free ONCE a year from EACH bureaus. So one strategy some people use is to first get a free report from Transunion, then 4 months later get a free report from Equifax, then 4 months later get a free report from Experian...then start all over with Transunion. That way you can get a free report every 4 months. Keep in mind though, that each report might have slightly different information as each bureau tracks this information slightly differently. Creditkarma.com - free estimate of your Transunion credit score. CreditSeseme.com - free estimate of your Experian credit score. These are completely free and actually pretty close to what your score really is. 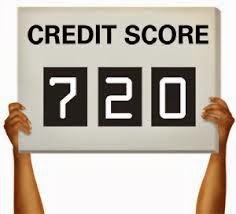 Right now creditkarma.com says my score is 754 and my actually credit score is 755.